The broad fields of science and art are often considered disparate, mutually exclusive, and hardly complementary. That’s a short-sighted view I’ll try to dispel today. This is a little off-topic for Sky Lights, but ultimately suggests a strategy for drawing the interest of non-scientists to science. And Sky Lights is always about education. The image above is a classic example. 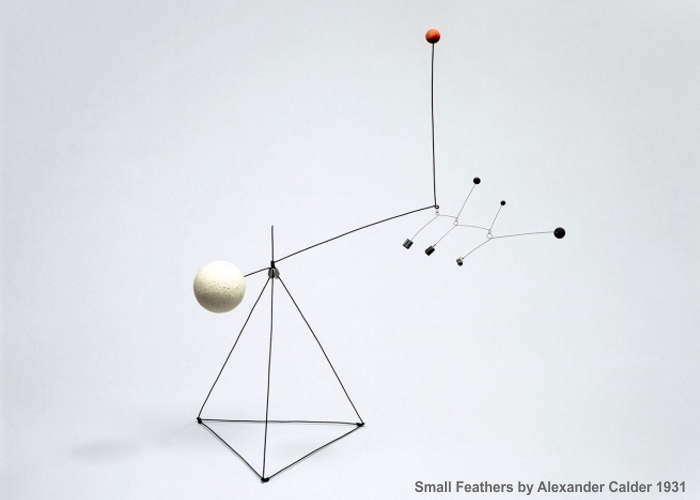 It’s a mobile by Alexander Calder, and combines the science of mechanics with the art of sculpture. I had the privilege of seeing some of Calder’s work in a visiting exhibit at the Milwaukee Museum of Art in the late 1960s. Calder did dozens of these pieces. Mobiles are fascinating to watch. The centers of mass of all suspended objects are precisely balanced. Even in a closed room, natural air currents set a mobile into motion. The appearance changes in a choreographed display of kinetic art. optics and jewelry design: The facets cut into gems enhance their brilliance using the laws of light refraction, reflection, and dispersion. This technique was developed in the Middle East ca. 11th century AD. mathematics and music: J.S. Bach composed music using mathematical patterns of notes, some time-reversed and others inverted on the staff. We are now seeing the beginnings of computer-composed music. electronics and music: Electronic synthesizers (popularized in the 1960s), the electric guitar (1931), and the Theremin (1928) opened up an entire spectrum of sounds not possible with traditional instruments. psychology and graphic art: Researchers (and artists) who create optical illusions exploit what is known about the eye-brain system for the purpose of understanding how this system works (or to simply entertain). materials science and architecture: Architecture is about appearance as much as structure. Many of today’s most beautiful structures were made possible by new materials like steel, pre-stressed beams, and geodesic domes. The funding they seek will pay for the production of a feature film for world-wide distribution by filmmaker Kai Staats of Over the Sun, and for a 360 degree film to provide an immersive presentation in planetariums and an interactive experience in VR headsets. This represents a quantum leap forward in STEAM, a new approach to education. By combining the science (and art) of videography with the arts of dance and music, they hope to leverage the emerging technology of virtual reality (VR). The film will appeal to the non-scientist, yet engage them in science. During the video, astrophysicist Paul Sutter (see his podcast Ask a Spaceman!) will provide narration for the performance explaining how each movement represents a stage in the birth, evolution, and death of a star. VR is poised to become the “next big thing” in consumer technology. It will impact entertainment, education, gaming, telepresence, remote surgery, data visualization, and other areas yet to be imagined. Good VR headsets currently run US $600-800, but prices will drop over time. At present, the industry is in a Catch-22 situation with not enough VR content to drive sales, and not enough sales to drive VR content production. Song of the Stars is a step forward on this front as well. But mostly, it’s a work of science and art that deserves to be preserved and shared. This post is the closest thing to an ad you’ll ever see in Sky Lights. Still, having a blog like this provides an opportunity to promote what I support (like the fight against light pollution). And I support Song of the Stars.